“Where are you from?” is a common enough question. For me, it is not a simple question. I always feel the question implies a lot more: where were you born? ; where did you grow up? ; where did you last live? ; and more. It speaks to your life before the moment the question is asked. It often includes an assumption that perhaps you spent the majority of your life or time in one place. I was born in Baltimore but we moved away when I was 18 months old. We moved, on average every two years, living in several places: Sioux City Iowa, various parts of the D.C. suburbs on the Maryland side, Indianapolis, New Orleans, Camillus, NY. It was a nomadic childhood until I was twelve, when we moved to the D.C. suburbs. We moved once after that to another suburb and I went to two different high schools as a result. It did leave me feeling unconnected to place for a long time. From the time I was twelve, we did live in the Maryland suburbs of D.C. and I then went to the University of Maryland also adjacent to D.C. One of the constants of our lives was our grandparents’ farm on Delmarva Peninsula just outside of Salisbury, MD. We visited there often. We stayed on the farm, followed our grandparents around and went to the beach. It has become our nirvana, our home, our solace, and our destination for life’s journeys. 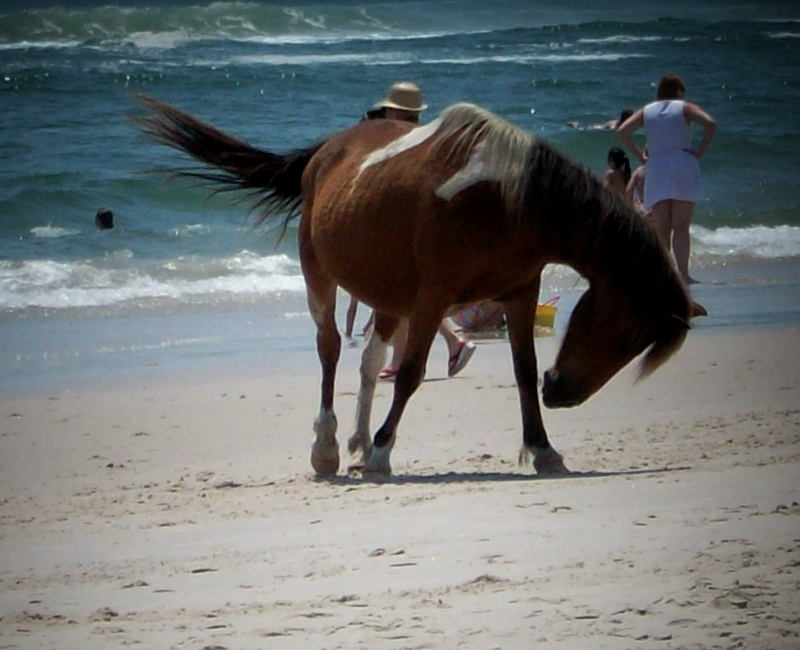 The beach, particularly at Assateague National Seashore, is part of my bones and blood. The beach is a metaphor, dream, and destination for a lot of people. When I was in graduate school, we were reading Sir Philip Sidney’s Arcadia, an English Renaissance poem praising about beautiful utopic place and our professor says, “Our modern-day Arcadia is the beach.” It is true if you live in that mid-Atlantic region. I’ve learned it’s not true if you live elsewhere. People in different areas have different ideas of paradise and utopia. To get to the beaches of the eastern shore from Baltimore and D.C., people need to cross the Chesapeake Bay, another threshold. 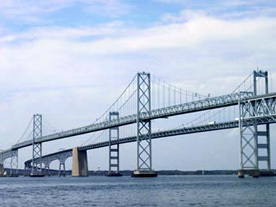 The Chesapeake Bay bridge is a modern engineering wonder, built in 1952, the year I was born. [I don’t care, you can do the math!] Now there are two, but in the old days and today still, the wait at “The Bridge” can be long. It’s very long expansion bridge that terrifies people. The bridge also serves as a threshold of crossing from one world to another. There are many differences between the life on the western shore and the eastern shore. “The Bridge” lives in the psyches of people as a challenge, a crossing, a pathway to enchantment and more. When I took a creative writing class at a local writing center, the assignment was to write a scene or part of the story where a monument, piece of landscape or significant landscape object was featured as a character or influence. The teacher commented after reading the stories that nearly everyone in the small class of ten had chosen the Bay Bridge as their significator. It was then that I realized that landscape and parts of the landscape have powerful influence on how we perceive the world. In 1992, I moved to Alfred, NY to take a new job. Alfred is a very small village in the southern tier of Western NY in the foothills of the Allegany Mountains. It’s a valley with three colleges populating the hills/mountains on either side of Main Street. Coming from the relatively flat lands of central and eastern Maryland, this was a big change. I didn’t really realize it until I started living there. I got an apartment just off Main Street, in the valley. It was a big adjustment of life for a suburban girl to rural living. No easy access to things I assumed were part of life. Shopping had to be planned because the bigger grocery stores were out-of-town. It was mostly the landscape, though. Don’t get me wrong, it is beautiful there. Rocky hills, rugged terrain, and wintry landscape. I always though the spring was not about graceful growth as it is in Maryland, but rather a triumphant and valorous struggle to be born. At the end of my third year there, I rented a house just inside the village, but further up the hill. I felt better there. I hadn’t realized that I felt like the mountains were closing in on me!On 1996, I got a job in Central New York and live halfway between Ithaca and Cortland. I have the best of both worlds. I can shop in the city where I work and drive less than 20 miles to a home in the rural countryside. I feel better here, like there’s more room. It’s still not home but I’m content in the beauty and grace of it. Well, except for the fact that it’s April and there’s still snow on the ground. Still don’t like that after all this time. Without knowing it, the landscapes of our surrounding shape our perceptions of ourselves, the world, and how the world works for us. Landscape brings us to paradise, our Arcadia. For each of us, it will be different. For me, it’s the stark beauty of Assateauge and the sandy soil of the farm. For others, it’s the rocky soil and rocks of the mountains, and for still others, it is the desert. We build our landscapes in our minds and hearts and when we do so, we create them as sacred and special. It is that ability to create the sacred from our hearts and souls that is part of our divine natures. For when we create sacred places and actions on this plane, we create them in the other worlds. We make real the Hermetic phrase, “As above, so below.” May the landscapes of your heart bring you joy, solace, and pleasure today and all days. I’ve lived in upstate NY all my life, first in the suburban outskirts of Schenectady, then the semi-rural (at the time, it has been seriously build up since then) suburbs of Clifton Park. Went to college on Long Island and hated it there, and transferred to the state college at Oneonta, where I fell in love with the area. I’ve lived in and around this small town ever since. These days I live about ten minutes outside of town, on a road that feels very rural. I can see neighbors out one window, but can’t hear them except in the summer when the windows are open. (Unless the hunters next door are shooting off their guns or riding their 4-wheelers, Oy). I remember taking the bus home to visit my family during the college years, and hitting a certain point in the ride back where the landscape changed back to the rolling hills and open pastures that said “home” to me. To this day, making that transition lifts my heart. Of course, I’d also REALLY like to go to the beach.